Easy selling...one stop drop off! it's easy and SOOO worth it! We'd love to have you as a consignor! A consignor is simply a mom (or dad!) that wants to get the maximum return on their kids outgrown items. It's up to you how much money you earn....like anything in life, the greater the effort the bigger the reward! You will also get a pass for you and a guest to come shop before the public to find the best deals first! The consignors presale is Wed, Feb 20th at 6pm. A $12.50 consignor fee comes out of each consignors check. Our average consignor check is over $350 (& we know you're not average!). 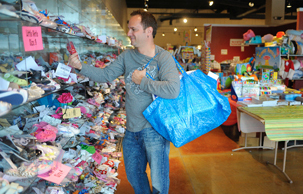 In addition to earning more money, volunteers also get to shop before consignors. The more you volunteer the earlier you shop! The sale is not just for clothes and shoes! Toys, books, games, baby equipment and more all sell great and will clear your house of clutter faster than you can imagine. Click here for a complete list of WHAT WE ACCEPT for our Spring event! I know, new things can be scary. But there are always new volunteers, so you won't be alone. Plus we'll hold your hand and you'll be an invaluble asset to the sale! More fun, more savings, more earnings, it's totally worth it! We have easy ways to earn 70% and 80% on your sold items, just by spending a little time with us at the sale. You'll meet new friends (and likely see some familiar faces) while inspecting, organizing, helping customers, sorting items and other fun tasks. More hands equals light work, plus we'd love to spend time with your smiling face! Shop the 50% off sale FIRST! All these benefits, plus having FUN with old and new friends! Why not? You'll be glad you chose to join us. If you can't volunteer "in person" we do have Bartering opportunities on the online volunteer schedule. This is where you help without spending 4 hours at the sale. These Barter's don't earn the increased % on your sold items but do earn the other benefits, like shopping early! You will be responsible for bringing your items inside the building and putting them on the sales floor, so please plan your time accordingly. Allow an hour in your schedule to be safe. Do you work a 12 hour shift on Tuesday? Or is there some reason you absolutely cannot do it that day? We have a very limited number of drop off spots Monday, Feb 18th between 6pm-8pm. Please e-mail us so we can chat if you need one of these spots. Mid-Sale Drop Off: FRIDAY, Feb 22nd from 5pm-7pm. Toys and Equipment typically need restocked at this point in the sale. Limit of 50 "inspection" items accepted during this time (clothing and shoes). SPRING SALE LIMITS: To allow the maximum number of consignors to participate, we do have a 500 item limit per consignor. If you have more hanging items to bring, you can always combine items and make one tag (i.e. three t-shirts on one hanger with one tag counts as ONE item). If you are bringing 200-250 clothing items and/or 400-500 total items and NOT marking donate on those items, please read the "Power Seller Guidelines" section below. DONATING your unsold items? Great! After drop off you are done....except for coming back to shop, of course! We'll take care of sending them to our charities, and you can email us for the tax receipt! Picking up your unsold items? If you have a conflict you can come during the other time slot, but for maximum organization and everyones convenience (including yours! ), please strive to come (or send a friend or spouse) during your designated time frame. Insider Tip: Volunteer the "sorting shift" Sunday night and you can take your items with you at the end of your shift! At 8:01pm we begin bagging remaining items and distribute them to our partner charities. Sorry, no exceptions. Many times, our consignors have very few items left. There is no penalty for you not coming and letting us donate your items, even if they are not marked for donation. However, please check the "donate" box when tagging if you know you don't want to come to pick up, as that alleviates the pressure of getting sorting complete in time. Thanks! Want to sell a furniture set, high-end stroller or other kid-friendly item you invested a lot of money in? Bring it to JBF Lee's Summit! You will earn 80% on any JBF tag of $250 or higher that sells (80%!! Even if you're not volunteering!). Avoid having strangers come into your home or the hassle of meeting up with a potential buyer and still earn a lot of money! We do have strong men and women that can help you unload furniture or big play equipment. Just come in and ask for help before you unload! LARGE ITEMS: If you have a large item (think "too big to carry to the hold area") like a pack and play, changing table, train table, toy kitchen, etc please bring your JBF tag in hand to the sale. We'll show you how to attach it to your item securely using our yellow claim tickets. This makes it easier for our shoppers to buy your great items! Baby Items: Bibs, cloth diapers, bottles, small toys, bows, socks, etc. can be in clear Ziploc bags with the tag attached to the inside or outside of the bag. You can use clear packing tape for securing the bags closed. This prevents 'little' hands from reaching in. Blankets and Snuglis sell better if they are hung and pinned to a hanger. Stuffed animals must "DO" something (musical or animated). Please do not tag Happy Meal toys...or any items that are given for free! Breast Pumps: If bringing a breast pump to sell, please price for $50 or less. Due to recent legislation, many insurance companies now provide pumps to expecting mothers, so they are less in demand than in the past. Cribs: Just Between Friends can only accept the consignment of cribs manufactured on or after June 28, 2011. Cribs manufactured from July 23, 2010 to June 28, 2011 may be consigned if the consignor provides a certificate of compliance from the crib manufacturer or retailer. Cribs manufactured prior to July 23, 2010 will not be accepted under any circumstance. Cribs that are unacceptable, for any reason, cannot be sold as toddler beds. Click here for a Crib Waiver, fill it out and bring it with you to check in. Must be musical or animated ("do" something) or they will be pulled from the sales floor. Even when they're adorable, those that don't "do" something just don't sell, as they seem to multiply on their own at our houses! No beanie babies or used webkins. Build-A-Bears must be accessorized or talk/sing. We have a 25 book per consignor limit. If you have more than that, consider "bundling" and selling some as a set. We accept parenting/pregnancy books, baby up to pre-teen. No adult, murder-mysteries, etc. Please flip through the pages to make sure they haven't been "decorated" or torn by ambitious little learners! For seasonal guidelines, please click here to view a complete "what we accept" sheet. We have to be specific on what season of items we accept at each sale so our racks aren't overwhelming to shoppers. LIMIT on Infant Items: We also have a limit of 50 items (tags) brought per consignor in sizes 9 months and smaller. New moms get so many of these teeny sizes as gifts, so we have to limit what is brought so we can be sure and sell through what comes in. If you have more to sell, feel free to put 3 (or even 5!) onesies or sleepers on a hanger and price together. Moms LOVE finding multiple items on a hanger! If you bring over the allotted amount of items you may be subject to a 10% penalty on your earnings. See "power seller guidelines" for explaination and exceptions. Only bring items in excellent condition and purchased new within the past 3-5 years. No tears, stains or obvious fading/wear. Discount Brands such as Faded Glory or Circo need to be in like-new condition and should have several items priced together as one. Price your clothing items at 25%-35% of original retail prices. SPRING '19 will be the final sale we accept juniors items! We will accept up to 20 items per consignor that are Juniors/Teens. Focus on labels such as Abercrombie, Hollister, Nike, Under Armour, Pink, Miss Me, Lululemon and other mall brands that teens wear. Please price these items to sell! No women's/men's brands or styles. These will be pulled from our racks and are unable to be sold. All clothing items must be hung using appropriate sized hangers. Wire, plastic or store hangers are fine. Use safety pins to secure the item if it will have trouble staying on the hanger. We do have a $3 minimum price on clothing. You can pair up items if needed, as long as they are the same size (they don't have to be an outfit). Two pairs of pants or two or more shirts will sell easily together. Non-clothing items do not have minimum price. Be sure and use white cardstock for your tags. CARDSTOCK is especially important on clothing, as tags on regular paper will get torn off more easily. WHITE is important as we used colored paper for internal purposes and your items will not be sorted and returned to you if on colored paper. White Cardstock is very inexpensive at Wal-Mart (in the office supply section). of your tags to a local print shop (like Kinko's or Office Depot) and have them print on cardstock for you very inexpensively. Safety pin clothing sets securely with pants hung on the backside of the shirt so both pieces can be viewed without unpinning them. Safety pin through BOTH pieces AND through the hanger (this will prevent pants from weighing down the shirt and causing a possible tear). We prefer you use safety pins but you can use a tagging gun. Barbs must be in the correct places for us to accept the items. Tags placed under the armpit, at the end of the sleeves and in the front fabric (where it makes a hole in the fabric) will not be accepted. Tagging gun guidelines sheet. DVD's: Make sure the disc is in the case and not scratched. Sorry, we do not sell VHS tapes and will automatically donate any that are put out on the sales floor. No rated R movies or rated M for Mature video games can be accepted. Expensive Electronics ARE safe to bring. DS's, PSP's, etc all sell great! Please hand them to the person at the check in computer at drop off as we take extra steps for the security of these items. Puzzles, Games or DVD's that do not have all the pieces (or the disc) will be returned at the shoppers request and you will be charged $5 per occurance. The same rule applies for an item with corroded batteries. Repeat offenders will be prohibited from consigning at our event. Furniture/Decor: All kinds of children's and juvenile furniture will be accepted. All furniture must be intact and sturdy. Only Children's Room decor will be accepted (no home decor). Bedding: We no longer accept bedding sets or bumpers. New moms are SO particular about styles/colors of these items and we need the space for items that sell more quickly. If you have a large item (think too big to carry to the hold area) like a pack and play, changing table, crib, etc please bring your JBF tag in hand to the sale. We'll show you how to attach it to your item securely using our yellow claim tickets. This makes it easier for our shoppers to buy your great items! Games and puzzles: These should have all pieces and be tied or taped closed. If you don't have time to check to make sure it's complete, do not tag and sell it! Puzzles, Games or DVD's that do not have all the pieces (or the disc) will be returned at the shoppers request and you will be charged $5 per instance. The same rule applies for an item with corroded batteries. Repeat offenders will be prohibited from consigning at our event. SHOES: Spring, Summer and Seasonless Shoes will be accepted. Don't forget the rain boots, cowboy boots and cleats! Make sure your flip-flops look like new and sandals are clean and in very good condition. Save your fall and winter shoes for the August event. All shoes will be inspected and must be in new or very gently used condition. Magic Erasers work WONDERS on shoes!! A little bit of effort can add up to a lot of $ for you! Try this on your sandals where the feet part shows dirt, and especially on the white part of Converse. It's easy to make them look almost new! Attach a tag with a large safety pin to the laces and, for extra security, place a piece of tape over the pin. I prefer to zip tie my shoes together, then pin the tag around the zip tie, then tape the pin. Extra secure! Shoes are handled a lot at the sale, so be sure that tag is not going anywhere (except out the door after someone has bought it!). Attach the tag to the shoes, NOT the box. Boxes aren't necessary to sell shoes and we'd prefer you leave the boxes at home. Avoid putting shoes in zip-lock baggies if possible. They are more likely to sell when shoppers can see them better. • Include batteries (you can get batteries very inexpensively at the Dollar Store) If we have to replace/provide batteries to sell your item, we will charge your account $1 per battery. • Make sure they are clean. If you're missing pieces but it doesn't compromise the toy, that's ok. Items that do not have all the pieces or don't work will be returned at the shoppers request and you will be charged $5 per instance. The same rule applies for an item with corroded batteries. Repeat offenders will be prohibited from consigning at our event. Are you a Power Seller? We have a 500 item limit at this event. If you have 200-250 hanging items and/or 400-500 total items you're bringing to the sale, we consider you a Power Seller! In order for our sorting to go effeciently, we do ask that you work a Power Seller Sorting Shift via the online volunteer scheduler (this shift is held Sunday evening). During this time you'll be helping us sort ALL consignors items, ensuring this big job gets done in time. You will not earn volunteer credit for this shift. You may choose a second volunteer shift to work during the event to earn the extra percentage on your sold items. Power Sellers unable or unwilling to help in this way will have a $40 charge or 10% less on their earned sales (whichever is greater) added to their consignor account so we can hire someone to work in their place. As an alternative, Power Sellers who mark Donate on all their items can bypass the sorting requirement and not pay the fee. Power Sellers can earn 80% by meeting the requirements of the JBF Crew Members, but are not eligible to earn 80% on their sold items via the All Star program, as the Power Seller mandatory sorting shift and the All Star sorting shift are at the same time. If you have questions regarding this, please email us. Next, email LeesSummit@jbfsale.com to let us know you qualify as a Power Seller. Get those items tagged and get ready to earn big!! Make an appointment, bring your items inside and hit the road. We'll be putting your items away! Item counts come from the number of tags you have in your tagging account. Delete old/sold tags so you’ll have an accurate number. We can show you how if you need help. Ready to sign up or ready to sign up? Email leessummit@jbfsale.com today! Let us relieve any undo concern or worry! Nationwide, loss or "shrink" from retail theft is around 1.5%. And in the past 11 1/2 years, ours at JBF Lee's Summit is MUCH lower than that! Each sale we find VERY small evidence of theft. However, if it will ease your mind you can undergo a process at drop off to guarantee your items. Any items scanned in after inspection will be returned to you if not sold or added to your check as if they sold. We'll have computers set up and show you how to scan in all the items you're dropping off. If you find any item you've scanned in not showing as sold or returned at pick-up, we'll add the amount into your check! You will have to undergo a scanning process at check out too. We hope this will be a smooth process but can't promise that it will be quick. Over the past decade we've had many instances of missing items that have worked themselves out. A stain was found so the shirt was donated at drop off, a husband left a bag of shoes in the trunk, even a toddler bed that was supposed to be missing never got brought to the sale! A miscomunication between husband and wife, can you imagine that? This is a good way for both the consignor and the organizer to feel secure in what comes into the sale will be properly taken care of and sold or returned to them. Just ask or look for the "items guaranteed" table at drop off and we'll show you how to do it. If you choose not to guarantee your items, that's perfectly ok and know they will truly be taken care of! There's a VERY slim-to-no chance anything will go missing. If you're like me (and many consignors!) you'll say "whatever" and be happy with the $350+ (yes, that's our average consignor check earned at the Spring sales!) you'll earn at the sale. But if you're the more conscientious type, we welcome you to take advantantage of this option. Consignors who are regularly "missing" items will be encouraged and/or required to do this for everyones peace of mind. But need supplies? We can help! E-mail LeesSummit@jbfsale.com TODAY to get your spot secured! We have a limit to how many consignors we can tag for, and we always fill up! Do you want your kids outgrown things to go to good homes and help local families? But still think it'd be nice to see a return on your investments, too? Like a regular consignor, you'll be invited to bring a guest and shop early at our Consignor Presale. We'd also love to have you as a volunteer, which will earn you a higher return on your items as well as get to shop even earlier! There's two fun ways to earn 80% on your sold items. One, be part of our JBF Crew! Details on that are on the Presale Shopping page. The other is called JBF All-Stars! It only takes a little volunteering, a little shopping and BAM, you've got 80%! Step 4: Earn 80% on your sold items!! Easy & Rewarding! We LOVE our loyal JBF-ers and created this program to say Thank You! !